Originally posted on January 8th, 2018 in Trade Secrets a blog from Nature Biotechnology. The biggest graduation for an academic researcher comes without diplomas or Latin superlatives, caps or gowns. It’s the leap from academia to business, the shepherding of our beloved ideas and inventions out of the known world of the lab and into the strange land of the marketplace. It’s a bigger jump than any researcher imagines. When my co-founder Sarindr (we call him “Ik” for short) and I graduated our bone-growth technology from a Columbia University lab to a startup company, we realized lab reports don’t translate easily to investor pitch decks, and hiring a lab assistant from within your university department does not prepare you to build a cohesive company staff. We knew how to respond to the requests of an academic lab director, but that does not equate to answering to the FDA. In short: A science project does not a science business make. That’s why I sought the guidance of leadership coach. I had discovered the benefits of coaching when I was a TED Fellow (through their SupporTED program) and transitioning my role from academic postdoc to EpiBone CEO. My coach, Mark Capellino, helped me find my best professional self, one session at a time, through self-examination, skill and connections to outside resources. I started to see clearly the overlaps (and gaps) between my dreams and my skills, to answer the essential question: “What kind of CEO do you want to be?” and then enact my answer. I knew this kind of expert guidance was indispensable for EpiBone—not only for Ik and me, but for staff at every level. A startup company is strong and nimble only when every teammate gets the support they need to do their best work. When obstacles arise within the team, the right coach can teach you to solve thorny social dynamics and smooth communications. As you increase the trust in the organization, you increase speed and efficiency. Ik and I wanted a New York-based coach who could embed with our team, and someone with the experience to guide us without getting dogmatic. We found Lori Dernavich, who has advised and coached a host of ex-academics before us. Lori, who previously worked as a high-tech recruiter and psychotherapist, specializes in leadership coaching at growth-stage startups. I am happy now to be able to say something radical: every single person who joins EpiBone is supported with one-on-one coaching. Besides coaching founders, Lori provides three to five sessions for every employee who is new or in a new role, plus monthly sessions for each manager. 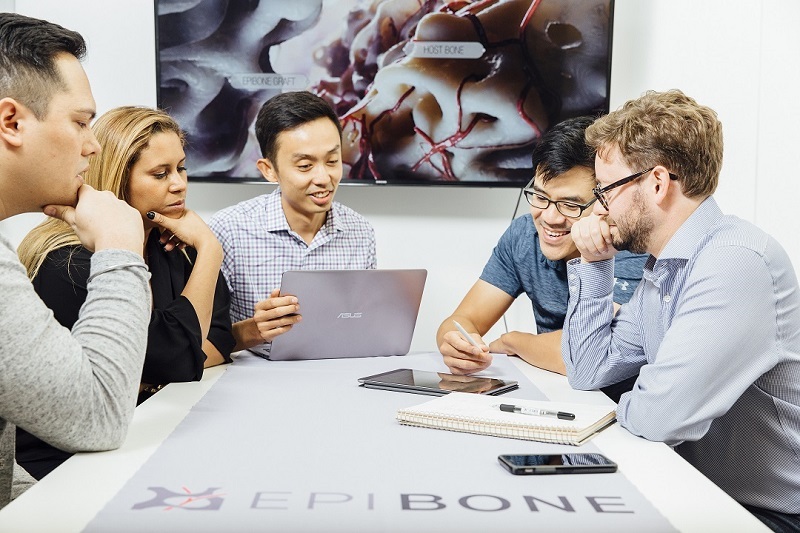 While her individual conversations are confidential, her wisdom and observations about the company overall help me keep EpiBone thriving—to grow a strong business while growing strong bone. I recently got Lori to go on the record about why every biotech startup founder needs a leadership coach. Here are highlights of our conversation. NINA: Lots of life-science executives come from academia. We’re in a new world here, but we’re smart people. Leadership coaching is not remedial. If you just got into the Olympics, wouldn’t the expectation be that you would need an Olympic coach? LORI: Yes. You hear all the time from investors that they invest in the people. They want someone with a lot of passion, resilience, grit, empathy—meaning they can really work with other people. But VCs don’t often put their money where their mouth is. They often only call me when there’s a problem, when damage has been done. Founders need someone to have their back as they’re leading and growing a team. When everyone’s a scientist, there’s little understanding of what’s coming next, or even what questions to ask in building a company. You can do it by trial and error, but startups have just a couple chances to make things work. It’s better to make fewer mistakes, or to recover from mistakes faster. With founders coming out of the sciences, there’s a natural desire to learn. You’re brilliant at what you do, but you’re willing to learn what you don’t know. I love that. NINA: I see the need for this in the life sciences only growing. The trend in the past 10 years is of Big Pharma getting their R&D off their balance sheets by buying startups. That has pushed people like me and Ik into the position of leading emerging R&D groups. If our last graduation was out of the lab into our own space, and from having government funds to angel funds, now we’re graduating from pre-clinical into clinical, and we’re transitioning from angel investors to VC investors. So I want to proactively address the pitfalls that many startups face, to be sure we address our blind spots in business building. Why would someone in my position seek out a science-leadership coach rather than a VC entrepreneur-in-residence (EIR) or simply a lot of deep reading? LORI: Lots of people I meet wonder about this. The answer is that a leadership coach—and, ideally, the startup leader—are after something deeper. An EIR is a subject-matter expert in science, operations, sales, or finance, but they usually don’t specialize in coaching or the human dynamics of organizational growth. A leadership coach works with startups on their day-to-day interpersonal issues and in the development of leadership skills needed to scale. Not only for the founders, but for employees at all levels (a.k.a. your future leaders). Plus, there are going to be some things you don’t want to take to your VC, like those moments of self-doubt and uncertainty that visit every founder. You can Google how to be a better leader all you want, but that’s not the same as having a coach there to be your mirror, to show you your blind spots. Blind spots are called blind spots because you can’t see them. NINA: I’ve found, too, that those more visible skills are easy to commodify. The value of good leadership is in the subtler skill sets. There’s a huge upside for people who recognize that. So as a founder, you have to ask yourself who are you going to bare your soul to, because you have to if you’re really going to do this work. LORI: Right. What’s needed in all startups are basics like hiring the right people, leading meetings well, articulating the big picture. Communicating everything, a lot. And delegating. Delegating is huge. This is my baby; how do I let it go, so that other brilliant people can take pieces of it? In life sciences specifically, founders are going into an environment that’s far more collaborative than academia. Scientists can be more introverted than those in high tech, so communication is also a challenge. How do you focus on other people? How do you turn your language into something that someone on the outside can understand? This is not soft stuff. It’s the team and the people that make your business. The quote-unquote softer skills are some of the hardest ones to learn. NINA: It’s the same with hiring. We may have had experiences as grad students working with undergrads in the lab, and we’ve trained them on the thing we want them to do. So, we think we’re good at hiring, but we’re not. We may be good at testing for skills. We don’t realize that we should also be interviewing for flexibility, adaptability. And we think we’re good at communication because we deliver a paper presentation twice a year. But we’re not. In a way, we’re being tricked. We think it’s the quality of the idea that carries the day and that we’re on an infinite timeline to get the right answer. In reality, by the time you figure that out the world has changed. We have to learn the 80/20 rule for startups, where the need for speed means you can sacrifice some accuracy. What’s the 80% correct answer that I can get to in 20% of the time? Because making an imperfect decision quicker is more important than making the absolutely correct decision too late. That’s the biggest shift. NINA: Lori, you led hiring and on-boarding workshops for our whole staff to help us figure out how to bring new employees into the company, in deeper ways than the standard paperwork. You helped us tailor our process to our company’s character. We got a chance to think tangibly about how to make sure we’re hiring the right people, what is our philosophy, what is the cost of getting it wrong. That was valuable. Instead of “the company culture is what it is because there’s only five of us and we’re all in the same room together,” now we’re 20 people, and you need to starting naming and codifying things to be sure they continue to live. You can’t just rely on osmosis and chance and serendipity. LORI: That’s true. Plus, people tend to feel more engaged and motivated if they have ownership. It shouldn’t just be for hiring managers to define our values. Anyone who is going to be working with new hires should understand what are you looking for. You don’t have to be managing somebody to be a leader. You should all have leadership skills and be able to come up with different solutions. LORI: Compared to solo academic work, building a company culture is completely different. As a startup, you have to define that from the get-go: What are our values? And then you have to live out those values in every area and action of the business. NINA: Yes. I’ve learned that every single thing you do is actually two things: you are transacting business and you are also demonstrating through your actions the norms through which your business should be conducted. When you’re growing bone cells, you can’t have cell culture medium that’s undefined. The reason it’s called cell culture is you’re trying to create an environment that works for your cells. What are the key ingredients that you need to make the cells not just survive but thrive, to foster attachment, proliferation, differentiation, collaboration? If we have this idea down pat when we’re thinking about how to encourage cells to grow, how do we apply that thinking to our company?